Look for mostly red plums to pick. They will ripen rapidly after picking, though, so a little green in the background will not be a problem. 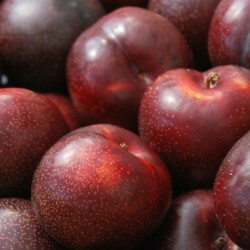 Sugar plums grow in clusters, so carefully select the plum you want and avoid picking a whole cluster. Pick them into a container no more than 10-inches deep, to avoid crushing the fruit.